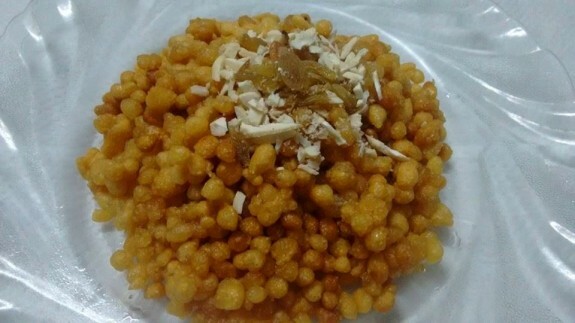 Boondi recipe is very simple and easy to make. Making the boondi is really fascinating as little balls will form as a shape on boondi which is really very cute to see. See the recipe here. 1. Take a bowl and pour besan into it. 2. Add sooji and mix it well. 3. Pour the water slowly and stir it continuously so that no lumps will occur. Batter should be very smooth and pour-able consistency too. Keep the batter aside. 4. Now, we need to make sugar syrup. 5. Take a huge bowl and add water and sugar and boil this on medium high. 6. While syrup is boiling, simmer the heat and add couple of drops of lemon juice and cardamom powder and mix it well. Cook it for another 2-3 mins and keep it aside to make it light cool. 7. Heat 1 inch of oil in a pan. Now take a hole strainer and hold it in the middle about 2 inch of high from the hot oil. 8. Now pour the batter slowly through the strainer into the oil to make the small round shape drops. 9. Fry them till it fried and lightly brown. 10. Now, remove it from the oil and pour it in the warm syrup. Mix it and sit it for a minute. 11. In the mean time, you can fry another batch of boondi by pouring the batter in the oil again through the strainer. 12. You can now take out the sugar immersed boondi and place it in a plate. 13. Again pour the next batch fried boondi into sugar syrup and keep it site for a minute. Place it on the same plate. You can do the same process again and again. 14. You can serve them as they are or also you can serve them with ice-cream or chocolates chips or chopped dried fruits.